If your organization’s pension plan’s funded status is on track, congratulations! But If you’re struggling to attain your funded status goal, you’re not alone. Help strike that balance with these steps. Why is pension plan funded status so important? When a defined benefit (DB) plan is underfunded, sponsors may find themselves needing to increase their plan contributions—often unexpectedly and by a lot—to avoid costly penalties or restrictions. As a business owner or a CFO, these type of funding “surprises” are not pleasant ones. To evaluate if you’re on track, you first need to establish what “on track” means for your plan. This depends largely on whether your plan is active or frozen. For active plans, you’ll want to consider the funding ratio on a PPA funding basis. That desired ratio might be the level needed to avoid benefit restrictions or eliminate PBGC variable rate premiums. If your plan is hard frozen, you’ll want to consider the funding ratio on a plan termination basis, keeping in mind that the plan will need to be 100% funded on that basis at termination. 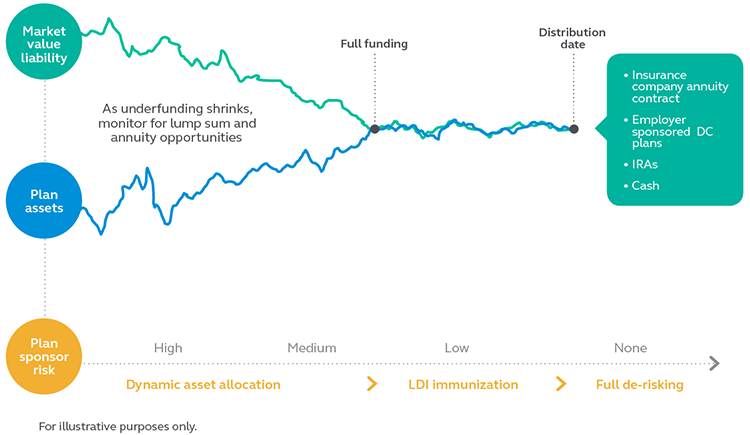 Under the Pension Protection Act (PPA), funding segment rates are adjusted to fall within a stabilization corridor around a 25-year average of 24-month segment rates. As this corridor widens and as new, lower rates move into the averaging, it’s likely that PPA rates will decrease in the years to come and result in an increase in plan obligations. 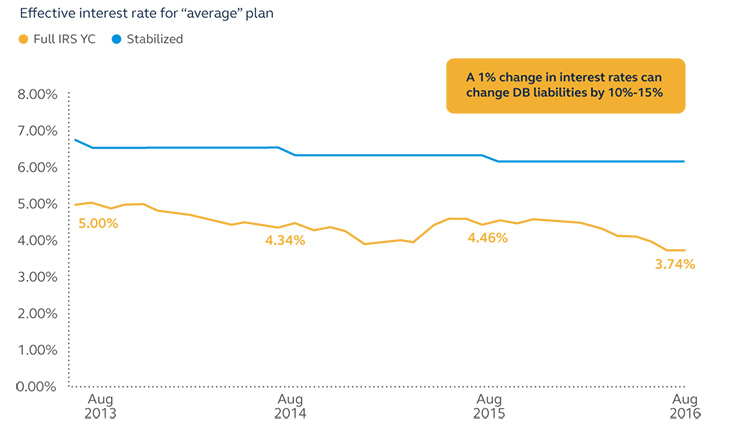 For many plans, a 1% change in interest rates—up or down—can change plan liabilities by 10 to 15%. Having a finger on the pulse of this factor will help you anticipate potential liability shifts. What are your options for managing your plan’s risk? You have 2 choices—manage the risk in-house or transfer the risk to another organization. Both present unique opportunities for reaching your funded status goal. Hard-frozen plans can present special challenges. How do you make sure your funded status is on track so you’re ready to terminate when the time comes? Your actuary should help you with an asset liability modeling study. As you evaluate the results of the study, look for what gets your organization fully funded on a termination basis in the shortest amount of time. Also, consider what reduces volatility the most and has the lowest cost in a variety of market conditions and interest rate environments. You’ll also want to consider the possible impact of different funding strategies. Whether you contribute the minimum required or spread the cost over time, it’s important to choose a funding strategy that works best for your organization. Maintaining a pension plan’s targeted funded status can be complicated. Principal is here to help. We have decades of experience with DB plans across many different industries. That gives us a deep understanding of the challenges you face. Our established best practices and processes can make it easier for you to manage your plan in a way that works for your organization and your participants. To learn more, give us a call at 800-952-3343, ext. 22681 or contact your advisor.